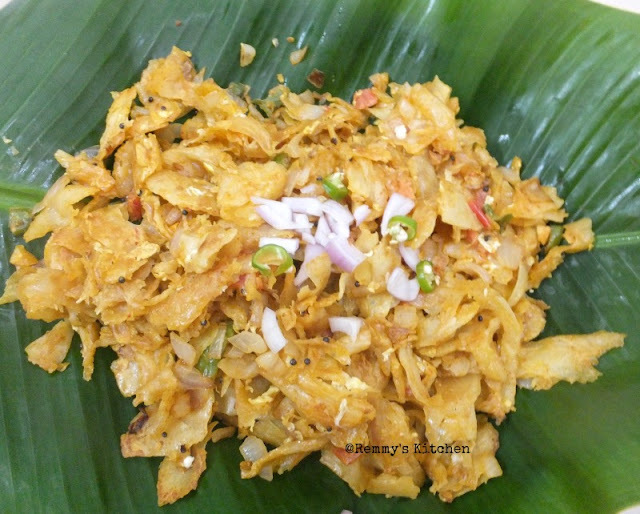 I love thattukadai items (road side shops)but my hubby doesnt like to buy anything from there by saying some hygienic issues.But once while travelling in chennai we saw a neat place and had kothu parottai from there.Wow..yummy..I saw there, they are preparing it in iron skillet and quickly chopping parottas and onion with a rhythm.Mixing and sauteing was so fast and finally he garnished it with some chopped onion. 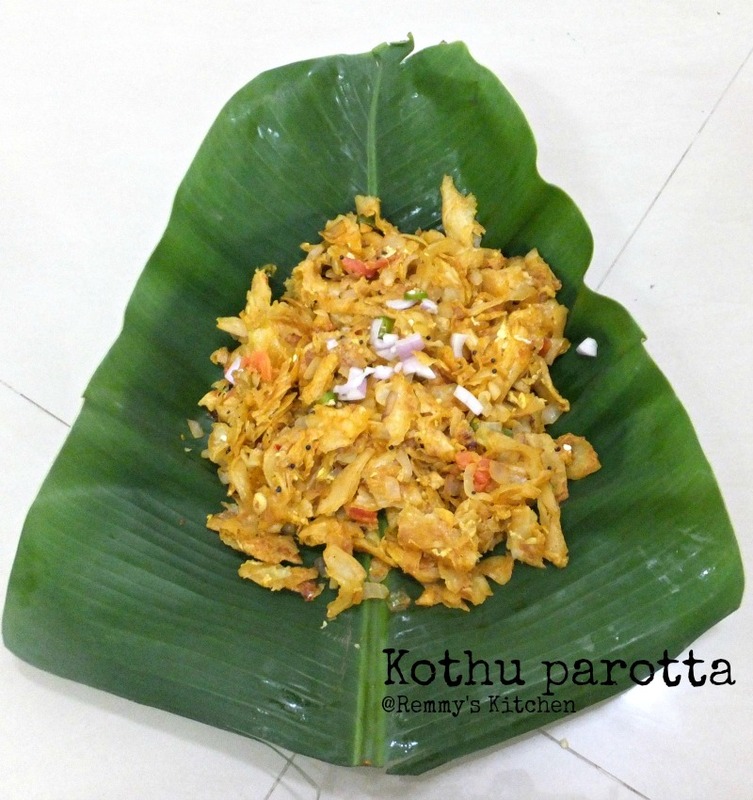 Tamilnadu parotta is thicker than Kerala parotta .If you are using thicker one chop it in to small pieces.When my hubby went to Kerala he bought a parcel from there so on that day morning I have prepared kothu parotta with egg.I did not use garvy in this preparation and used only egg.But if you are vegetarian you can choose veg kothu parotta recipe in which add veg salna or korma gravy together with chopped veggies.Even without gravy you can prepare it ..
Chop parottas and set aside. Heat a pan with oil and add in mustard and let it splutter. Add in chopped ginger garlic onion and green chilly .Saute it well. Now add in chopped tomato and saute it well. Add in garam masala and chilly powder.You may avoid chilly powder and use more green chillies as per your choice. Mix it well and add in chopped parottas. Beat eggs with salt and pour it over the parottas and mix it well. Wait for few minutes and allow the eggs to cook. Garnish it with chopped onions and coriander leaves. Yummy egg kothu parotta is ready to serve!!!!!!! Very lovely plating. 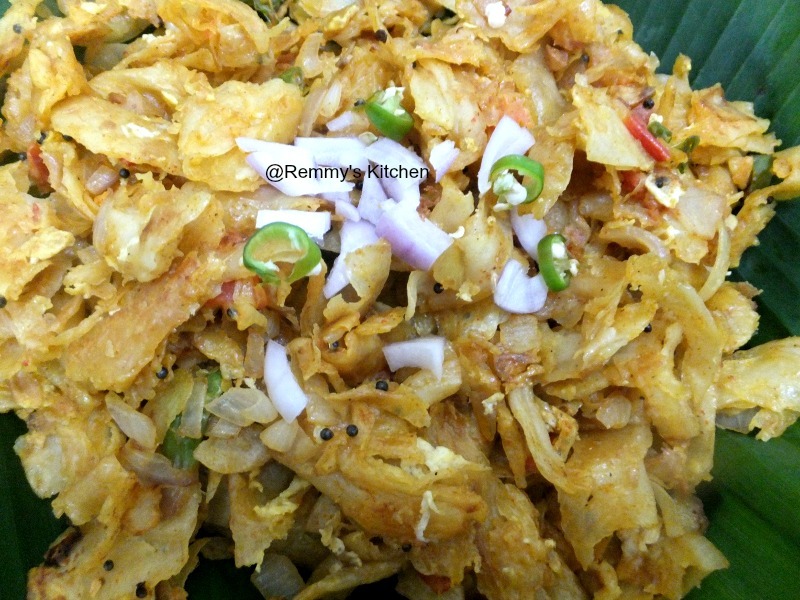 On the banana leaf - makes this dish truly divine.